What I love about this purple geometric damask design comforter is that it has a pattern within a pattern. Notice the cool geometric design that is inside the damask pattern of the bedding. This purple geometric damask bedding set is made of polyester and is machine washable in cold water, perfect for teen bedrooms. This purple bedding set is available in a twin and full size set and includes the comforter and matching pillow sham. 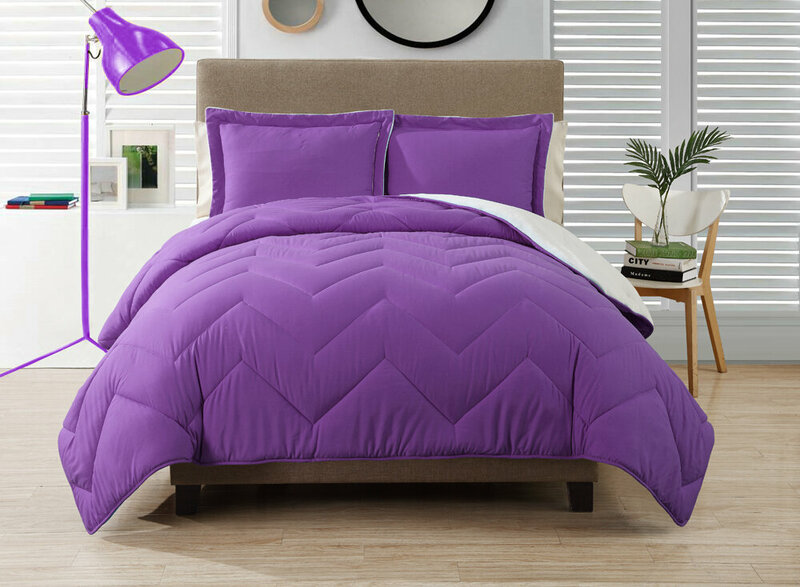 This purple geometric design comforter would look awesome in a girls bedroom because it's modern and on trend with what's popular now. I love the look of purple chevron bedding and this one is quite unique because it's a solid purple print. I love solid purple comforter sets because they can easily be matched to a bedroom design. Solid purple bedding sets work with any purple bedroom ideas you might have in mind. Chevron stripes are very popular, the design works with any color and it really pops with purple. This purple comforter set is available in a twin size, other sizes may be available soon. This purple paisley bedding set is the perfect mixture of springtime colors. The purple and green mixtures are a very lovely blend that work well together. This purple paisley bedding set features the comforter, sham and bed skirt and it has a variety of beautiful decor accessories to match. This purple springtime comforter set comes in twin size, full size, queen size and king size. This purple and green paisley bedding has decorative pillows and a 350 thread count sheet set available.